Firstly as a set of dreads ready for installation; complete with bands and instructions. Perfect for a night out. All dreads are made from Kanekalon® synthetic fibre. This is a set of 14 single ender dreads make from kanekalon synthetic fibre. This is currently a dreadfall made up of 22 DE dreads making 44 ends. They are 18 - 19 " long approx. These could easily be removed and braided into your hair. The dreads are about sharpie thickness and curly are in very good used condition. 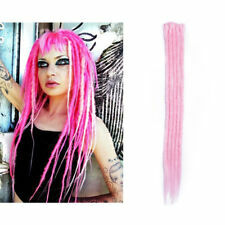 Pink Double Ended 22inch Synthetic Dreadlocks. Condition is New with tags. 24 dreadlocks all together, perfect condition.